It's official: Britain has chosen to leave the European Union. And markets are getting whacked. Global stocks are in meltdown mode, the pound is getting clobbered, and analysts are getting antsy about the possibility of a serious economic downturn in the UK and elsewhere. But while the markets may have seen violent swings in the immediate aftermath of the vote to leave, the longer-term political ramifications of a Brexit are interesting to consider, too. 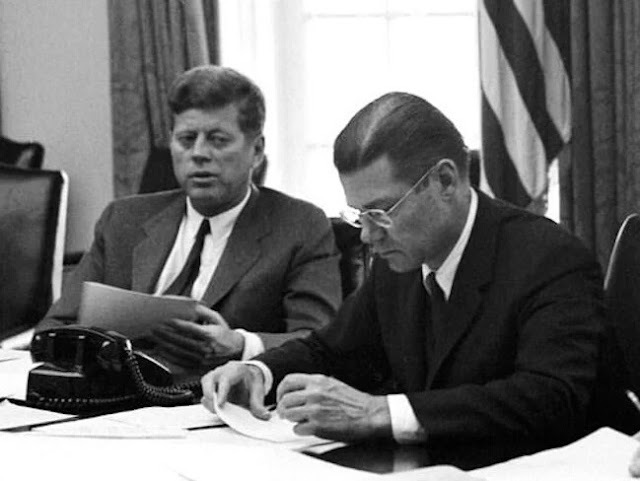 Earlier in the day, Eurasia Group President Ian Bremmer tweeted that the Brexit is "the most significant political risk the world has experienced since the Cuban Missile Crisis." When asked to explain what he meant by that comparison, Bremmer told Business Insider in an email: "Yes it's a significant shock for the near term. But it's the tipping point it reflects longer term that really matters. Much, much more G-Zero." The term "G-Zero world," coined by Bremmer and political scientist David F. Gordon, refers to a power-vacuum world in which "major powers set aside aspirations for global leadership — alone, coordinated, or otherwise — and look primarily inward for their policy priorities." In this kind of environment, global governance institutions become confrontational hotspots, and, as a result, economic growth and efficiency slows. As for the Brexit, it has "enormous long-term and structural impact" and "critically undermines the Transatlantic Alliance — the most important alliance in the postwar era," Bremmer said. It "sharply weakens and probably leads to eventual disintegration of the UK" and "also ends further EU integration," he said, "while the Brits need to be maximally punished by EU countries to ensure there isn't a path for further exit." For what it's worth, Bremmer isn't the only one who warned of long-term political ramifications of a Brexit, including less EU integration going forward. "We are very skeptical that the Eurozone and EU would respond to Brexit with attempts to deepen integration in the near-term. ... Opposition to further European integration is fairly widespread across EU countries, both north and south and both debtor and creditor countries. We would therefore mostly expect a 'freeze' in terms of integration even though some areas may well see further headway (e.g. for existing initiatives in various areas, including banking union, capital markets union or energy union or some movement towards a Eurozone chamber in the European Parliament)." "Beyond the immediate risk events of the Brexit referendum and Spain election, geopolitical agenda remains in focus. This backdrop makes policy progress very unlikely as domestic politics drive the agenda [leading to] limited room for country-level structural reform [and] little progress toward EU or eurozone reform or integration." 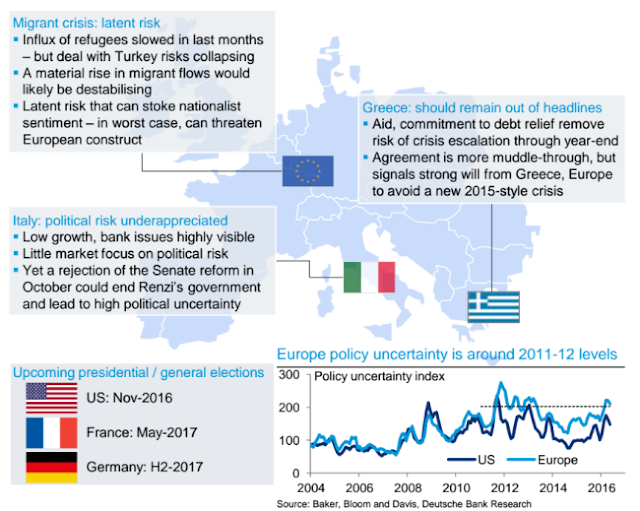 The team added that "policy uncertainty is and will remain high," and noted that policy uncertainty in Europe is now around 2011-12 levels comparable to those during the height of the eurozone crisis. Things are certainty starting to churn in Europe.